In 1914 the People of Texas funded and the State of Texas erected this granite monument in honor of Fannin and his men. 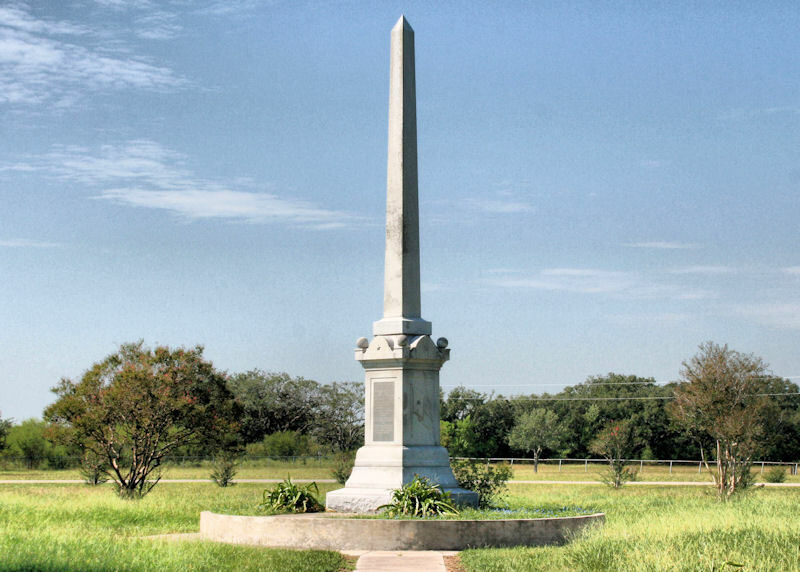 The Battle of Coleto Creek and the subsequent massacre of 342 members of the Texian Army a few days later at the presidio in Goliad was caused by a series of poor decisions and procrastination by Colonel James W. Fannin. Colonel Fannin not only procrastinated was also at a disadvantage because he disrespect for the capabilities of his enemy, General José de Urrea and the Mexican army. The site of the Battle of Coleto Creek was originally call the Battle of the Prairie. The retreating Fannin army was caught out in the open prairie and today the site has not changed much. The death toll of the battle and later the massacre after the surrender was almost twice that of the Alamo and Battle of Jacinto combined. It is easy for history to second guess Colonel Fannin and his leadership skills but he and his men were Texas patriots. By their inhuman execution they rallied the remaining troops and added to the battle cry at San Jacinto, "Remember the Alamo, Remember Goliad." After the fall of the Alamo, March 6, 1836, Colonel James Walker Fannin, with about 400 solders, mostly volunteers from the United States in the Texas war for independence, was ordered by Texas General Sam Houston to retreat from Goliad to Victoria. ; March 19, the heavy Mexican force of General Urrea Surrounded the withdrawing Texas contingent near Coleto Creek, and bitter fighting ensued. Fannin's volunteers hurled back the assaults of the Mexican force. ; On the following day, faced with several times their number, the Texans surrendered in the belief they would be treated as prisoners of war of a civilized nation. ; After removal to Goliad, the Fannin men were marched out and massacred on Palm Sunday under the orders of Santa Anna, the general of the Mexican Armies. ; Thus dictator Santa Anna added another infamy to that of the Alamo and gave to the men who saved Texas at San Jacinto their battle cry, "Remember the Alamo, Remember Goliad The Memorial to Fannin and his men is near Goliad. the sacrifice of their lives at La Bahia. They died to break the tyrants yoke. The bivouac of these dead"